It is a measure of a robust movement for their language and script that the Santhali segment of the subaltern class could on Monday render railway operations out of joint in Bengal’s Junglemahal belt as well as Jharkhand and Odisha. The region, that straddles what was till recently the Maoist bastion, was cut off from the rest of the country. Not that this is the first time the demand for the recognition of the Olchiki script has been raised; as often as not, the Adivasi, shrilling for the recognition of his language as any other, has crippled life in downtown Kolkata as well. Notably in October 2004 when Biman Bose, then the CPI-M’s state secretary, flew off the handle when a High Court judge reportedly criticised the Adivasis for the traffic disruption in Chowringhee. Monday’s rail roko, spearheaded by the Bharat Jakat Majhi Pargana Mahal ~ the largest outfit of tribals ~ has critical implications for the administration, and not merely in West Bengal. On closer reflection, the demand is no less relevant for Jharkhand and parts of Odisha as well. In a sense, therefore, the Santhali language is the thread that binds the class group of no fewer than three states in the eastern region. Palpably enough, the tribal is up in arms over a profoundly emotive issue, one that is as close to the bone as the availability of rice at Rs 2 a kg. For all that, a comprehensive solution must of necessity involve the three state governments and also, of course, the respective legislatures. 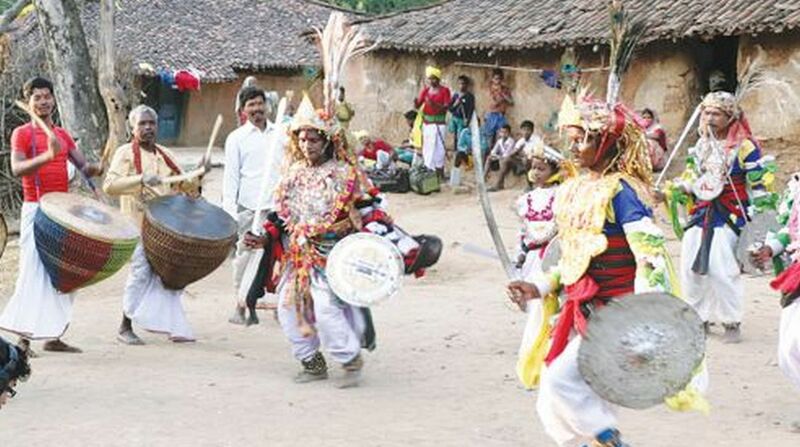 As trains screeched to a halt and passengers were stranded across South Eastern Railway, the traditional dance of the Adivasi, flaunting the bow and arrow had a different connotation altogether. The equally traditional drum-beating was intended to buttress the demand for the inclusion of the Olchiki script in schools and colleges. Not wholly unrelated is the clamour for the publication of books in Olchiki for the Santhali-medium schools and the recognition of Santhali as an official language of the state. Regretfully, many of these schools do not have sufficient teachers of the language, a major shortcoming that has been greeted with indifference by successive dispensations, irrespective of whether it is helmed by the Communist Party of India (Marxist) or the Trinamul Congress. Arguably, the linguistic demand could have influenced the vote for the Bharatiya Janata Party in the recent panchayat elections. “We had taken up our demand with the state government many a time. We were assured that our demands would be met, but nothing has been done so far,” is the lament of the entity that organised the rail roko. And on Monday with the Chief Minister abroad, there was no response from Nabanna to the blockade, let alone the demands.